Breakfast is the most important meal of the day. Breakfast is breaking a fast; a fast you undergo from the time you had dinner to the time you have breakfast. Importance of breakfast has been stressed by athletes, dietician, doctors, physical trainers. Breakfast provides the necessary fuel required for the brains and body after the overnight fast. Meals usually consumed for breakfast provide important nutrients like iron, calcium, B vitamins, proteins and fibers that are necessary to function during the day. A balanced meal of carbohydrates, proteins and minerals and vitamins is what most breakfast meals provide us with. Eating cereals, eggs, lean meat, fruits, vegetables, milk products take care of the required balance meal. Eating a well balanced and filling breakfast helps us to feel full most of the day and its unlikely that one will binge at lunch or dinner if one has had a hearty breakfast. Skipping breakfast usually makes us reach out for sugary treats at mid day or lunch time. Having breakfast restores glucose levels needed for brain function. Eating breakfast improves memory and concentration levels. Empty stomachs make us moody and as a result raises our stress levels. A hearty breakfast helps to maintain a good mood and therefore more capable to deal with stress. Hearty breakfasts help to maintain the energy we require to get through the day. Eating breakfast also helps to maintain a long term health. It wards off obesity, high blood pressure, diabetes and heart diseases. Breakfast kickstarts our metabolism helping to burn calories throughout the day. However, its important to eat healthy food for breakfast and avoid fried and greasy foods and foods high in sugar. Serving the same old types of food for breakfast can get a bit boring. 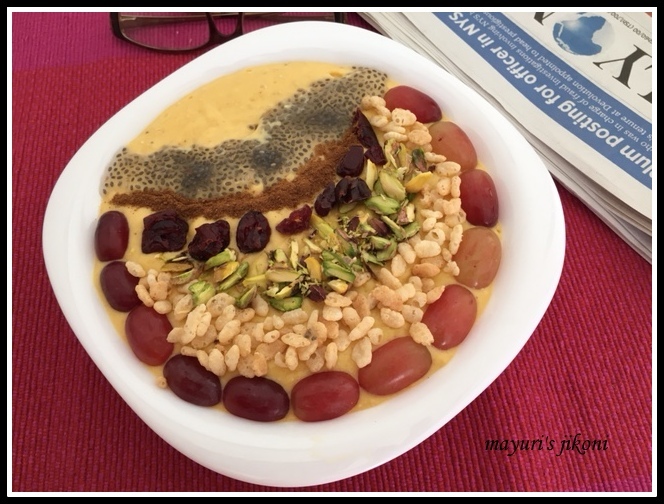 I prefer to have different variety for breakfast whereas hubby dear is happy to stick to his oatmeal with fruits and nuts. Give that to him 365 days and he’s happy. I need variety, cannot eat the same things for days. The Shhh Cooking Secretly group decided on a breakfast treat theme for the month of November. I was paired with Rafeeda who I met in Dubai. She blogs at The Big Sweet Tooth. She’s a sweet and very friendly person. Rafeeda gave me oats and nuts to prepare a breakfast treat. You may think November is long gone and the year is ending. I got very busy preparing for my daughter’s wedding. 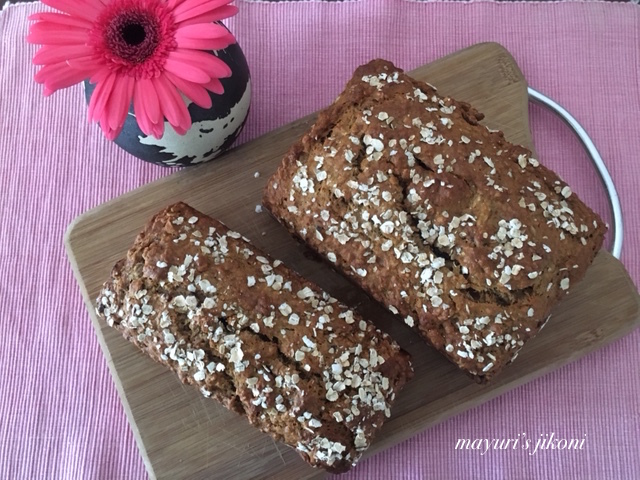 Though I had baked Oatmeal banana quick bread twice in October, I just didn’t get the time to write the post. However, as the saying goes ‘better late than never’ so here’s my breakfast treat using oats, nuts, dried fruits, banana and egg. Preheat the oven to 180°C. Grease a loaf tin 9″X5″ or two small ones with butter. Dust it with flour. Sift the flours, baking powder, baking soda, cinnamon powder and salt together into a big bowl. 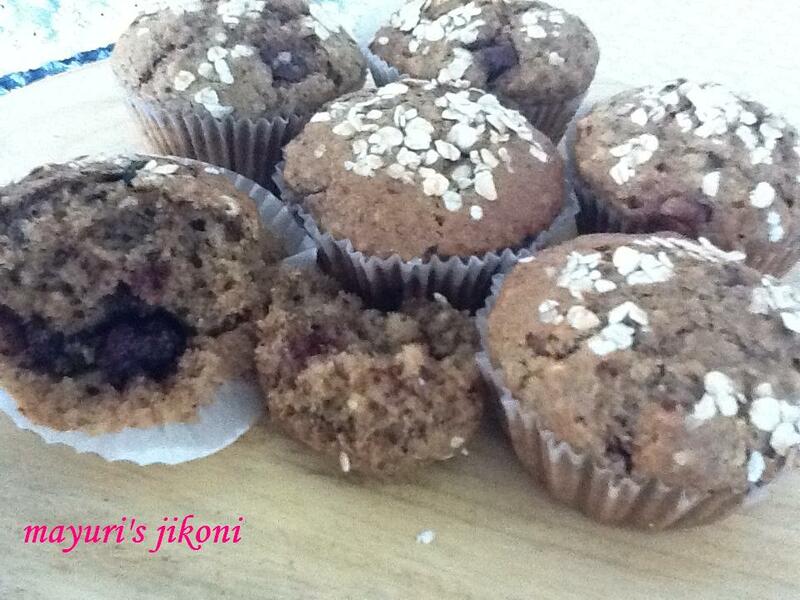 Add oats, nuts and cranberries to the flour mixture. Mix well. In another bowl add both sugars, egg, oil, vanilla extract and mashed banana. Whip well. Add flour mixture to the liquid mixture and mix gently till the flour becomes wet. Do not over mix. Bake for 40-50 minutes. If you bake in smaller loaf tins then it will take 25-30 minutes. Bake till the top appears golden brown. Leave the bread in the tin to cool for 10-15 minutes. Remove from the tin and serve for breakfast or any time of the day. Use honey instead of white sugar. Use nuts and dried fruits of your choice. Over ripe bananas are best for baking. 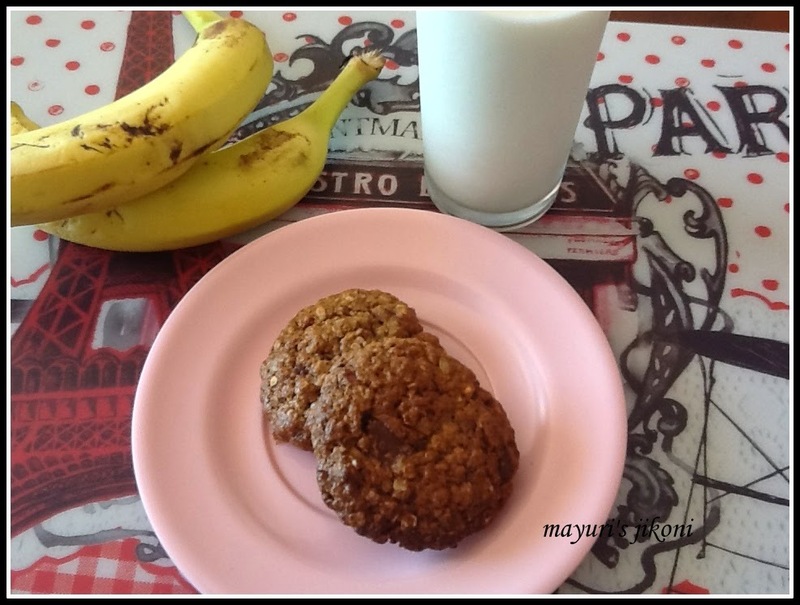 I freeze over ripe bananas and use them when required.